Ask and you shall receive; seek and you shall find; knock and it shall be opened to you, says the Lord, alleluia. Merciful God, through the service of Saint Conrad You were pleased to open wide to the faithful the portal of mercy. May we pursue his spirit of poverty and humility of heart in serving our brothers [and sisters]. 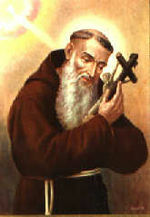 Saint Conrad was known to focus his life by the rule of charity in and out of the Capuchin friary. His daily goal was to remain in the presence of God striving to be free of sin and in constant conversation with God. Hence his devotion to adoration of the Blessed Sacrament which he spent every free moment doing. The 11 Resolutions of a Novice, from which some of these ideas come, are his maxims to orient one’s behavior toward the Holy. Besides Mass which was his greatest joy, Conrad had great devotion to the Crucified Lord and Our Lady of Sorrows. 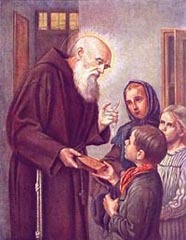 Of the latter, he promoted devotion to the Blessed Virgin Mary by distributing rosaries to those whom he encountered in the porter’s lounge or on the street. Saint Conrad is the patron saint of doorkeepers, one of the most important jobs in any home or institution. The upright live forever, their reward is with the Lord and the Most High has them in His care. Father, You lifted up and enflamed Saint Peter Regalado with the gifts of heaven. Through his loving intercession and by the example of his mortified life, may we come to eternal blessedness with all Your holy ones. From a wealthy family and having lived in an era of history making (the Western Schism), Peter entered the Conventual Franciscans but later joined a reformed group of Franciscan friars. He inspired and educated his brother Franciscans by his life. He lived with significant mortifications; his biographers note that Peter lived with hunger, subsisting on bread and water. 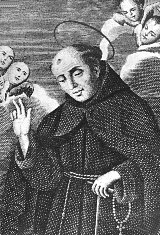 Solitude and a devoted life are key aspects of Saint Peter Regalado’s life. His body is incorrupt. In some places Saint Peter’s feast day is May 13. According to the OFM liturgical ordo Blessed Diego’s memorial is observed on January 6 but other liturgical sources note his feast is on March 24. Lord God, You teach us that the commandments of heaven are summarized in love of You and of our neighbor. 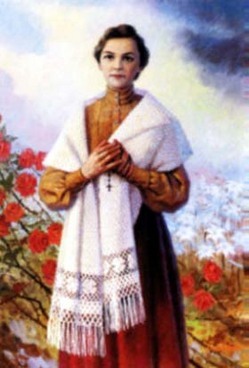 By following the example of blessed Angela, the virgin, in practicing the works of charity may we be counted among the blessed in Your kingdom. In order to follow more closely Christ crucified and poor, she joined the Secular Franciscan Order on March 15, 1912, and she professed vows on 6 August 1913. As a lay woman consecrated to Christ living under the Rule of Saint Francis for the Laity, Angela is an example to all of us that obstacles can be overcome with grace. At her 1991 beatification in Kraków, Pope John Paul II said: “It is in this city that she worked, that she suffered and that her holiness came to maturity. While connected to the spirituality of St. Francis, she showed an extraordinary responsiveness to the action of the Holy Spirit” (L’Osservatore Romano, 34.4, 1991). the grace to follow his example so as to share in eternal joy. that he was asked to be ordained a priest and to make Franciscan foundations. devoted to the Blessed Virgin Mary. More on Saint John Joseph can be read here.